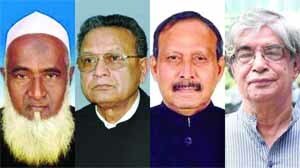 All four tedchnocrat ministers have resigned their posts following directive by Prime Minister Sheikh Hasina. They submitted their resignation papers to the Cabinet Division on Tuesday night, sources said. Earlier, Sheikh Hasina asked the technocrat ministers of her Cabinet to step down after Election Commission announces the election schedule. General Secretary of Awami League Obaidul Quader told it to the reporters at Ganabhaban at the end of the Cabinet meeting on Monday. "There is no room for the technocrat ministers in the election time government," he said. However, the other ministers, he said, will remain as usual in their respective posts. Currently, there are four technocrat ministers in the cabinet they are: Religious Affairs Minister Motiur Rahman, Posts, Telecommunications and Information Technology Minister Mustafa Jabbar, Expatriates' Welfare and Overseas Employment Minister Nurul Islam and Science and Technology Minister Yafes Osman. The latest political development spans amid widespread speculations that theÂ Dr Kamal Hossain led Jatiya Oikya Front might submit a proposal on Wednesday during the talks with the Prime Minister to form an election time cabinet inducting few numbers from the opposition parties. Obaidul Quader said, they may sit in talks for several times with their alliance partners to settle the seat-sharing issue. Once the dialogue is over, he said, the Prime Minister will deliver a winding-up speech over the outcome of the ongoing political dialogue in a press briefing at Ganabhaban on Thursday. He also said there is no room for holding any more dialogue after Wednesday next. Earlier on November 4, Election Commission announced that it would be announcing the complete election schedule on November 8. The schedule will include the dates of collecting and submitting nomination papers, scrutinising and withdrawal of nominations.